At least 12 teachers have been detained wile 30 activists were summoned and interrogated during a nationwide teachers’ strike on November 13 and 14. In a November 15 statement published on Telegram the Teachers’ Trade Organizations’ Coordination Council said that more than 12 teachers were arrested since Sunday while at least 30 activists were summoned and interrogated. “Activists were summoned to the Intelligence Agency, Revolutionary Guards Corps Intelligence Department, Protection Agencies and Security Police in almost all the provinces that participated in the strikes,” the statement said. The Council said that more than 12 teachers were arrested since Sunday. “Mohammad Reza Ramezanzadeh, the Secretary of the Iran Teachers’ Trade Association in North Khorasan Province, who was detained after the October strike and was just recently released, was arrested again after intelligence agents raided his home on Monday. Following his arrest, five other members of the Managing Board of the North Khorasan Teachers’ Association were detained. They have been identified as Saied Hagh Parast, Ali Forotan, Hamidreza Rajaie, and Hossein Ramezanpour and were all taken to an unknown location,” the Teachers’ Trade Organizations’ Coordination Council said in its statement. The Council reported that Pirouz Nami and Ali Korushat, two other activists were detained in Khuzestan Province. Security forces confiscated Mr. Nami’s phone and sent fake messages to other teachers saying that the strike had been cancelled. Reports also indicate that another activist Mohammad Robati and Ms. Vaezi were arrested in Shirvan, northeast Iran. Teachers and activists were also arrested in Fars and Arak. They include Mohammad Ali Zahmatkesh, Mohammad Kord and Fatemeh Bahmani. While condemning the crackdown and arrests, the Teachers’ Trade Organizations’ Coordination Council warned the authorities against the consequences of arrests. The council also urged the authorities to immidiately and unconditionaly release the detainees, put an end to crackdown on trade unionists and frameing up against them. “It is obvious that if the suppression continues, the Coordination Council deems necessary the right hold legal protests based on the constitution,” the Council said. Iranian teachers have went on a nationwide strike on November 13 and 14 to demand better working conditions for their poorly paid profession, one month after their last mass protest. In a statement published on Telegram, the Coordinating Council of Teachers Syndicates in Iran said it was staging its “second round” of strikes since October to pressure the government to carry out educational reforms and end mismanagement. It said teachers also were protesting low wages and perceived violations of the educational rights of students and minorities. The strikes and sit-ins were held despite various forms of threats and harassments by the regime’s repressive organs and forces and the summoning and arrests of a number of teacher activists. 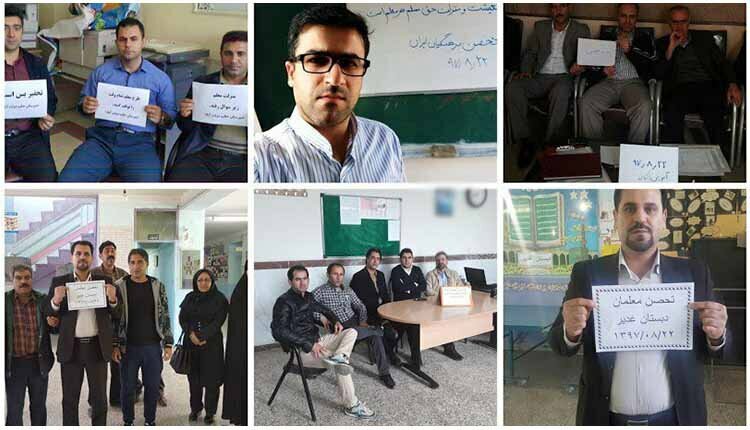 The second day of the second round of strikes and sit-ins of teachers took place in more than 40 cities including Tehran, Isfahan, Shiraz, Tabriz, Ahvaz, Mashhad, Yazd, Kermanshah, Ilam, Hamedan, Ardebil, Jolfa, Babol, Sari, Noshahr, Langrood, Karaj, Shahriar, Shahr-e Ray, Saveh, Sanandaj, Baneh, Saqqez, Marivan, Ivan-e Gharb, Sirvan, Chaboksar, Kazerun, Lamerd, Homayounshahr, Jam, Asaluyeh, Bushehr, Qazvin, Zanjan, Shahr-e Kord, and Charmahal-e Bakhtiari.